This makes finding a gun with a short enough trigger reach and a comfortable grip a pain. 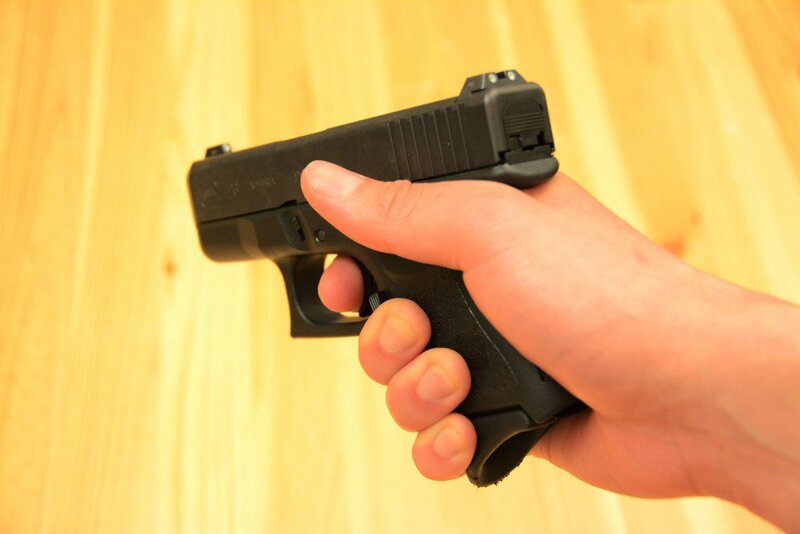 To start, when you hold a handgun, your trigger finger should have a shallow curve and the pad at the end of your finger should rest on the trigger. On a gun that’s too big, your finger will be straight along the side of the frame of the gun in order to reach the trigger. You also want to make sure that the rotation of your hand isn’t causing you to compromise the strength or comfort of your grip, or hold your gun at an angle. 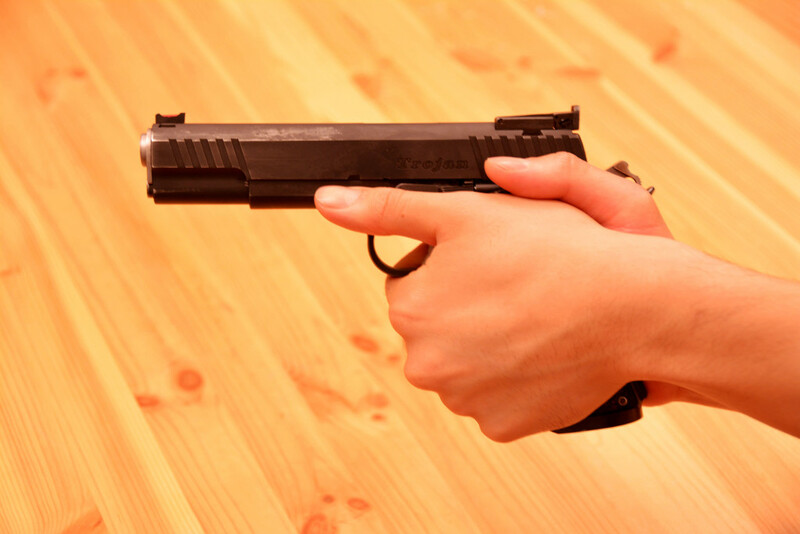 For small hands, a two-hand grip makes it much easier to control your gun, especially since smaller guns, which are usually easier for small hands to grip, tend to have more recoil. Bring your non-shooting hand under your grip, so its heel rests against the heel of your shooting hand while helping to support the gun. However, relying on a two-hand grip is less than ideal for a defensive situation, where one of your hands may be injured. For a defensive gun, it’s best to go with a gun that fits your hand well, but a two-hand grip is good enough for just killing time at the range. Now that you know how to make sure a gun fits your hand, as well as how to adjust your grip for larger guns, let’s move on to some gun recommendations. The M&P 2.0 doesn’t have completely replaceable grip modules, but it does come with four different sizes of grip inserts to help you customize your fit. And if the smallest insert is still too big, you can actually use the gun without any insert at all. Love a 1911 but feel like it’s too much gun for your hands? 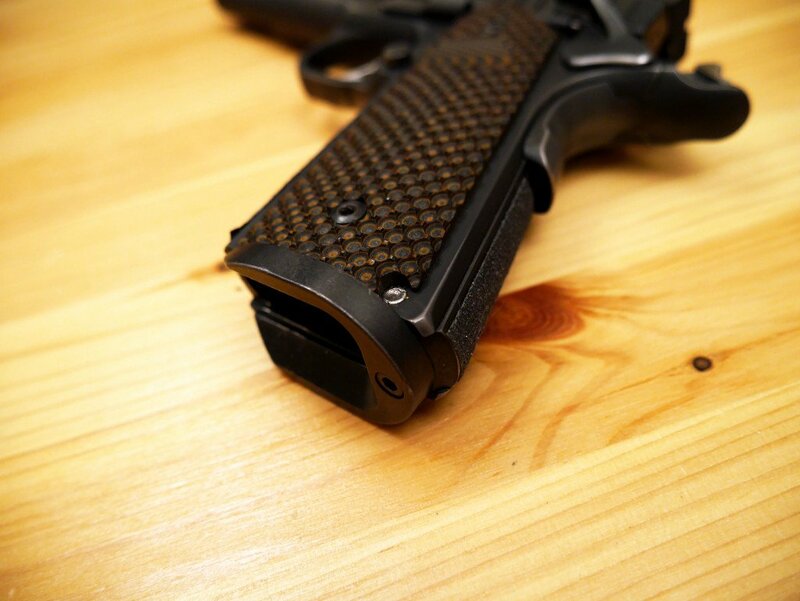 Then the Springfield 1911 EMP may be just what you’re looking for. Speaking of aftermarket options, maybe you already have a gun that you love, but it’s a bit too large for your hands. Let’s talk about some options to make the gun work better for your hand size. Depending on your gun, you can get an aftermarket grip and switch it out yourself. There are tons of brands out there, but a few of my favorites are Altamont Company, Hogue, and VZ Grips. 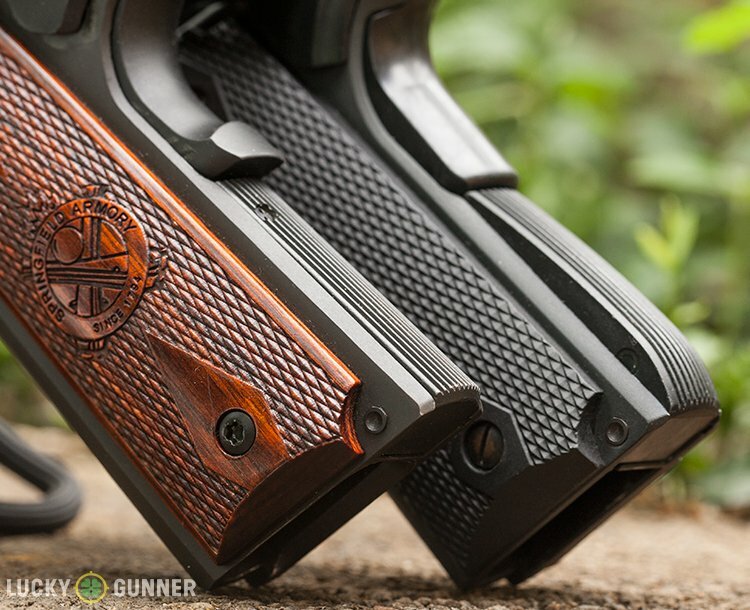 A textured grip will make your handgun easier to grip. You can either get a textured grip or get a textured wrap that goes over the grip you have from a company like Gun Grip or Talon. If your gun’s grip can’t be easily switched out or you can’t find a grip you like, you can also see about having the gun’s grip reduced by a gunsmith. But be warned: a poorly done reduction can make your gun much less functional, so make sure you have it done by a gunsmith with an excellent reputation. In addition, a grip reduction will void the gun’s warranty and can make it more difficult to sell later on, so I’d go with a grip reduction as a last resort. Lucky Gunner has a great article on grip reductions if that is something you’re interested in. If you’re really having a hard time with mass market grips, try a custom grip first. There are tons of companies that make them, as do many gunsmiths. They may also be able to switch the grip out for you, which is great if you have a gun where changing grips isn’t such a straightforward process. Finally, a small grip and reach help make holding and shooting your handgun easier, but they aren’t replacements for basic firearm skills. Without solid fundamentals, you won’t be able to shoot comfortably, accurately, and safely no matter what gun you’re shooting with. What are your favorite guns for shooters with small hands? Have any tips to share to help us shoot better or a solution to retrofit a gun to fit small hands? Also be sure to check out our general Best Handguns for Beginners. What about an HK VP9 with the smallest grip panels? They come with three changeable backstraps and six side panels, so it looks to be the most adjustable pistol out there. It also comes in a subcompact model, the VP9 SK, smaller but with the same features. And don’t forget my personal favorite, the Walther PPS M2 (on sale today at Palmetto State Armory for $270). I like it best with the 8-round magazines (+1 in the chamber). Fits my hand better than any gun I own except the S&W J-Frame with Spegel boot grips. I thought the Springfield XD9 was the most comfortable I tried. I thought the Soringfield XD9 was the most comfortable I tried. GP100 instead of SP101!?!?! For small hands! Definitely need to let our fellow small handed shooters that the Ruger SP 101 might just be the perfect fit for them. I have small hands and my personal fav is the Sig P228 (I haven’t handled a P229 but assume its grip dimensions are very similar, if not identical).